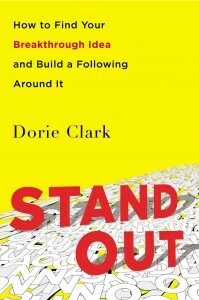 I recently spoke to my good friend Dorie Clark as she released her new book, Stand Out: How to Find Your Breakthrough Idea and Build a Following Around It. Clark is a marketing and strategy consultant and frequent contributor to the Harvard Business Review, Entrepreneur, and Forbes. She consults and speaks to a diverse range of clients, including Google, the World Bank, Microsoft, and Morgan Stanley. She is also an adjunct professor of business administration at Duke University’s Fuqua School of Business. Her first book was Reinventing You. In the following interview, she talks about what it means to be a through leader, how to find your big idea, and what it takes to build a following in today’s competitive world. Dan Schawbel: What does it mean to be a “thought leader” and how does it help you stand out in order to build a business or get ahead in your career? Dorie Clark: We all know it’s getting harder for your message to get through these days. There’s a huge amount of noise, and people clamoring for your attention. That’s why it’s so essential to develop a reputation as a recognized expert, because it gives people a clear reason to choose you over the competition – the topic I discuss in my new book, Stand Out. The term “thought leader” sometimes gets overused, but I think it’s a useful framework, because it implies two essential things. First, that you’re recognized for your thoughts and the quality of your ideas: you have intellectual heft as a professional. And second, that you’re not just an expert, but also that you’re a leader – meaning that others recognize and are responding to your ideas. You’re making a real impact. Schawbel: How does someone find their own unique and compelling idea? Does it happen naturally? Clark: It’s important to start by immersing yourself in your field. Have you read the most important, foundational books? Are you familiar with what the current experts are saying? Then, you need to look beyond that framework and ask: what aren’t they talking about? What are they missing? It’s when you open up your perspective that you can start to see gaps, and places where you can begin to make a contribution. Robert Cialdini, the legendary author of Influence: The Psychology of Persuasion, realized that even though academics like himself had been propounding certain theories about influence for years, it was all based on work in a laboratory setting. He was the first who said, What could we discover if we tested this in the real world? And as a result, he made breakthrough discoveries that changed his field. Schawbel: What are some ways to start building a platform for someone who isn’t famous or well-known in their niche? Clark: Online activities like blogging or creating a podcast certainly help in building a platform. (In fact, I had tried unsuccessfully to land a book deal for several years, and it was only once I started blogging that I was able to generate interest from publishers, leading to my first book, Reinventing You.) One platform-building activity that I think hasn’t been explored enough is self-publishing books. In Stand Out, I profile a young woman named Miranda Aisling Hynes who actually landed a job at an arts organization on the strength of a self-published book about creativity she’d written. The book enabled Miranda to showcase her philosophy and stand out from the other candidates. Schawbel: How do you go about building a following of people especially when there is so much competition and clutter out there? Clark: One of the most important steps in building a following – something that’s often overlooked – is testing and refining your ideas first with a group of trusted friends and colleagues. Too many people come up with ideas, throw them out into the public sphere with a blog post or some other perfunctory gesture, and then if it doesn’t go viral, they assume the idea was a failure. In actuality, it may have been a good idea, but just hadn’t been refined quite enough. This initial step of getting feedback (and connections and support) from colleagues before going public is essential. Schawbel: How can being a subject matter expert at work help you? What do you say to people who think they should be “generalists”? Clark: Becoming known in a niche is an important way to stand out. The competition is truly fierce if you want to get known in a broad and well-established field like “politics” or “sports” or “business.” There’s no clear reason for anyone to listen to you, who is just starting out and almost certainly has a lot fewer resources than, say, NBC or ESPN. But if you pick a subspecialty, you really can outwork even the big guys and become recognized for that. Brian Stelter was an unknown college student when he started a blog about the TV news industry, and he covered it so well and so thoroughly, he became the go-to expert on the subject. The New York Times was so impressed, they hired him, and today he’s at CNN – all because of a niche he cultivated wisely, and when he got his toehold, he was able to expand his expertise and reputation into adjacent areas of the media.